Wells Roofing strives to provide the best quality roofing available. The entire Wells Roofing team makes this possible. Our team is made up of true craftsmen/tin smiths-some of whom have been with us for 20 plus years. Joe Wells, Owner: Joe grew up in Georgia with his entire family in the roofing business. After moving to Charleston he started his own company in 1984. Joe has always been passionate about preservation, restoration, and the original craftsman’s workmanship. Through much study, research and hands on fabrication, Joe has been able to re-create these techniques. This approach is historically correct and eventually has evolved into specialty work exclusively. Wells has always re-invested in equipment to help increase productivity and quality. The scope and longevity of our custom projects are testament to our uncompromising standards. 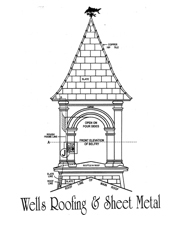 For 34 years, Wells Roofing has been providing the Lowcountry with custom roofing and fabrication with integrity.